SPECIAL ANNOUNCEMENT -- NOW -- You will be able to purchase your favorite supports enhanced with magnets. I know this is a controversial subject in many areas of the country. We make no wild claims. We will offer a few magnet enhanced products to our customers for their convenience and perhaps to conduct trials of their own. We believe the physicians should be able to provide their patients with properly designed supports enhanced with magnets. Your patients will have the benefits of your years of education and experience, of an accurate diagnosis and responsible follow-up care. The patient should not have to buy the magnets on the street corner from someone without proper diagnostic training. It is our contention that magnet therapy is a useful tool in the hands of someone acquainted with trigger points and referred pain. If you will provide us with your email address we will share information with you about magnet therapy and new products as they become available. Email to dsanders@tartanortho.com or visit our web site at www.tartanortho.com. Don't be lulled into thinking this is just a passing fad. Last year the American public spent half a billion dollars on magnets and related appliances. Which begs the question "Who is treating your patients?" An example offered here is the 2193E with magnets for an introductory price of only $29.95 that's less than you can buy the magnets alone. This is the 9" Criss Cross Sacro Lumbar Belt that has been our all time best selling back support. Your patients will be getting the same compression and support as always. However, we have added an extra value. We have enhanced the benefit of this support by adding two 2" x 8" flexible magnets. Here is some information about the "flexible magnets" in the 2193E. The magnets have a parallel north/south orientation and are embedded in a flexible vinyl to conform to the body's curvatures, for patient comfort. It is very important to hold the magnet next to the skin ( a magnet will be rendered useless with a little as 1/8" separating it from the injured area). For this reason, all of our flexible magnets are laminated with 3/16" padding to keep it held close. We are the only ones to offer this necessity. The flexible magnets have 12 poles to the inch. They are rated as having a surface measurement of 650 gauss. In addition to this back support here are some of the other items available with magnets - Arthritic hand support, Wrist support, Tennis elbow splint, Ankle support, Knee support, and Shoulder wrap. Many of these have powerful ceramic magnets sewn in for ease of application. Here is some information about the other style of magnets we use "ceramic magnets ". These are unipole ceramic magnets which only show one pole on each side. The magnetic charged particles are encased in a ceramic material to prevent oxidation when exposed to perspiration. They have a surface rating of 3950 gauss and are very efficient for treating joints or in positions where it is not necessary to use a flexible magnet. The magnets are sewn into an inside pocket of thin material to keep them next to the injured area. This deluxe tennis elbow support is made of 1/8" double sided neoprene . The circumferential design allows for easy one handed application, which is the way most of us put it on. 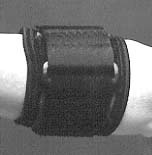 The 2" strap has a lock loop closure for positive adjustment. 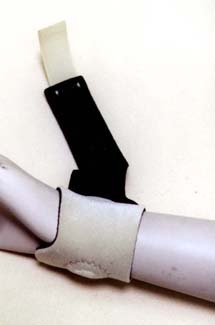 The strap closes over a pressure pad to put direct pressure on the lateral humeral epicondyle for optimal results. No pinching of the skin into the buckle. It has two powerful (3950 gauss) ceramic magnets to increase the circulation and enhance the natural healing process. A wonderful wrap so easy, so convenient, so effective. It simply wraps around the wrist and catches on the velcro sensitive outer material for a comfortable fit. If more pressure is desired it has a tension strap that allows you set precisely the pressure you want. The warmth of the neoprene helps to relax the wrist muscles and the two powerful (3950 gauss) ceramic magnets increase the circulation to help the wrist heal naturally.. Catalog # 98616S 98617M 986181L 98619XL Circumference Small 25"-30" Medium 30"-36" Large 36"-48" X Large 45"-52"
Individual Flexible Magnets are available in many sizes and shapes for your comfort and needs. They all are padded on the side away from the magnet side. The padding insures that the magnet front will be held comfortably against the skin for the most beneficial results. They all come with adhesive backed velcro hook strips for use with our other accessories which are used to hold the magnet in position over the painful area. They all have alternating, north/south, parallel pole magnetic orientation and have 12 poles to the inch, and all are rated for the maximum effectiveness of a flexible magnet at 650 gauss.